MINOT, N.D. – Minot State University staff member Kowan O’Keefe has already put together quite a list of experiences since he started at MSU as a freshman just eight years ago. Originally from Creston, British Columbia, O’Keefe began his time at Minot State mainly due to a chance to play collegiate golf. 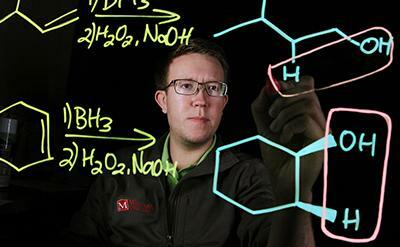 “I came here in 2010 to play on the college golf team and started as a biology major, but ended up graduating with majors in chemistry and math,” he said. However, he didn’t just spend time on the golf course while attending college. O’Keefe had the opportunity to present research he was working on in the lab to state, regional, and national conferences. One notable event he presented at was Posters on the Hill in Washington, D.C. Posters on the Hill gives students the opportunity to showcase their research to congressional members, meet with their representatives, and learn about advocacy for undergraduate research. Only 60 applicants are able to present while hundreds apply. “I’m definitely a big fan of politics and that was really a cool opportunity to see how science plays a role in public policy and to communicate what type of research we’re doing with policy makers who are quite intelligent, but they don’t necessarily have a very strong background in chemistry or in math,” O’Keefe said about the experience. Presenting research eventually took him beyond the United States. During his senior year of college, O’Keefe represented the American Chemical Society at the United Nations Climate Change Conference in Lima, Peru in 2014. O’Keefe attended a second United Nations Climate Change Conference in 2016 after having graduated with his masters at the University of Toronto. The second conference was held in Marrakesh, Morocco. After his time in Morocco, O’Keefe found himself back in Minot visiting his brother Karson O’Keefe. At that time, the opportunity to work with students at Minot State in the POWER Center – Providing Opportunities With Enhanced Resources – became available. In addition to working in the POWER Center assisting students, O’Keefe was elected president of the Minot State Staff Senate May of 2018. MSU Staff Senate essentially gives staff a channel to make suggestions or recommendations. “We have a staff satisfaction survey that goes out every year, and then based on the results of that, if there’s an idea that a number of the staff thinks we can change, we’ll try and find a way to accommodate or make those changes to make the experience better in whatever way that we can,” he said. “I’ve got the first chapter in that book which is basically explaining why the Paris Agreement is a good deal and why the U.S. should be a part of it,” he said.